He’s hoping for a good ending to his college career that started in 2012, as a quarterback. (Chris Detrick | The Salt Lake Tribune) Utah Utes defensive back Chase Hansen (22) during the game at Rice-Eccles Stadium Thursday, August 31, 2017. 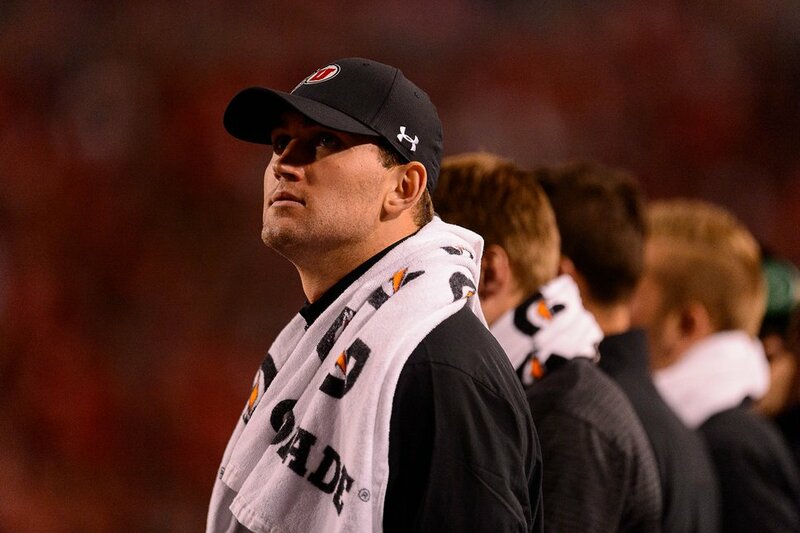 Utah Utes defeated North Dakota Fighting Hawks 37-16. Hollywood, Calif. • Utah receiver Britain Covey wishes he could have “Chase Hansen” as a superpower. Hansen just hopes to remain a healthy version of himself as a senior linebacker, applying the physical traits that his teammate envies. Imagining someone with Covey's hands and shiftiness, standing 6-foot-3 and weighing 230-plus pounds, is a fantasy. The real possibility of Hansen's playing a full season in 2018, pressuring quarterbacks and making tackles all over the field, is almost as exciting to the Utes. 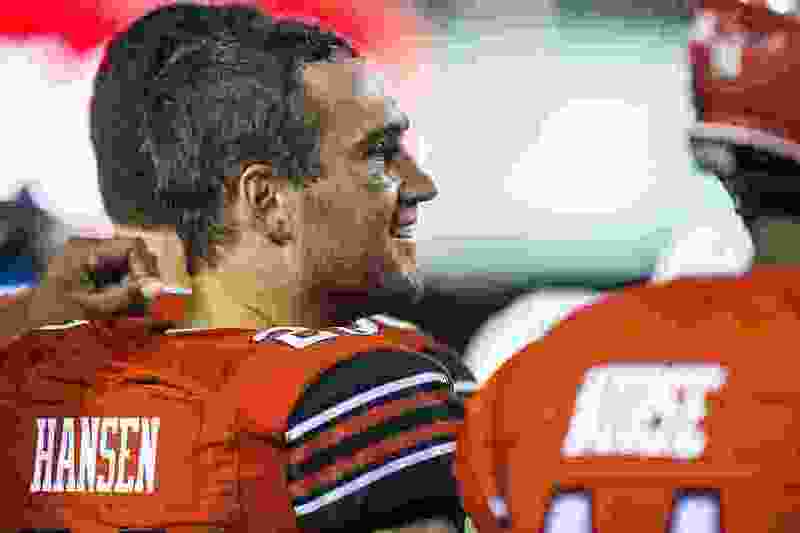 Hansen wants a satisfying ending for himself and his teammates in a college career that began with his redshirt season of 2012, as a Utah quarterback who arrived in a recruiting class with Travis Wilson. So here’s Hansen, six years years later, having served a church mission and played three seasons amid injuries and position changes. He’s hoping to lead the Utes somewhere they’ve never gone — to the Pac-12 championship game, with preseason practice beginning Wednesday. He's playing linebacker, having transitioned from safety in a move that's less abrupt than switching from quarterback. Based on Hansen's athletic ability and Ute coach Kyle Whittingham's history of turning QBs and other offensive recruits into defensive stars, everybody knew that was a possibility. Even so, he joked about his original script of playing quarterback, winning a Heisman Trophy and leading the Utes to a national championship (that last part remains in play, theoretically). It is worth wondering what Hansen may have become as a college QB, after he produced possibly the greatest 24-minute quarterbacking performance in Rice-Eccles Stadium history to end his Lone Peak High School career. In the 2011 Class 5A state championship game vs. Fremont, Hansen accounted for 398 yards of offense in the first half. As the Utes' third-string quarterback in 2015, playing behind two seniors, Hansen willingly moved to defense in the last one-third of the season. He loves the job description of hitting people, although his aggressiveness has led to some injuries. Staying healthy this season is important — “It’s my goal, it’s my prayer, it’s my plan,” he said — but he’s not about to alter his approach to the game. (Trent Nelson | The Salt Lake Tribune) Utah's Chase Hansen watches the game from the bench as the Utah Utes host the San Jose State Spartans, NCAA football at Rice-Eccles Stadium in Salt Lake City, Saturday September 16, 2017. Hansen’s season-ending injury in 2015 was simply bad luck. He had switched to defense, replaced a senior starter and become a star with 11 tackles in his first start, only to get hurt when a teammate rolled into him on a meaningless play to conclude the Utes' victory at Washington. He recovered from that severe ankle injury and made it through the 2016 season mostly intact, leading the Utes in tackles, but missed five games due to injuries in 2017. “My biggest wish is for him to stay healthy and play the way he wants to play,” Brian Hansen said. The Utes have had some fun this summer, with weekend activities such as rope swinging, cliff jumping and paintball after a week of tough workouts. Wednesday marks another phase, the start of a new season. Hansen is eager for his senior year to begin, and he really wants to be there in the end. High school football • Quarterback and part-time safety for Lone Peak, a 41-21 winner over Fremont in the Class 5A state championship game. High school basketball • Starter on a team with future BYU athletes Nick Emery, TJ Haws and Talon Shumway that beat Brighton 68-38 in the state title game. College football • Redshirted at Utah in 2012.... Made 11 tackles at Washington in his first start at safety before being injured. … Led the team with 90 tackles in 2016 and had four fumble recoveries and three interceptions. … Made 11 tackles at Oregon, shortly before missing the last four games of the 2017 season with an injury. … Nominee for the Wuerrfel Trophy for academic excellence and community service.